This function is only available to Kanshudo Pros. GO PRO now, and get access to the full power of the Kanshudo system for your studies. 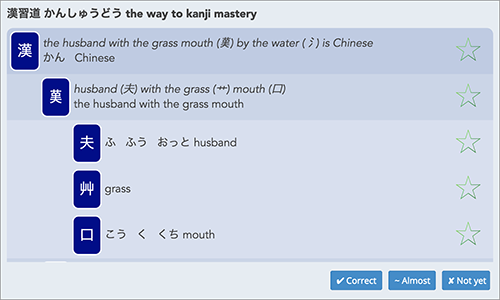 Kanshudo Pro membership brings unlimited flashcards, unlimited access to lessons and collections, unlimited access to games, and much more. A Pro subscription is unbeatable value for speeding your Japanese studies. Flashcards are a very powerful way to study. Kanshudo flashcards work well on computers as well as phones and tablets so you can study any time. Kanshudo automatically tracks your progress and shows you cards for review at intervals based on how easy you found them to learn. View statistics on status of your cards and when they will come up for review. Kanshudo flashcards are free for registered users. If you are already registered please LOG IN. If not, registration is free, easy and fast - REGISTER now to access flashcards. Backs of cards are automatically generated showing kanji and word details in the same form as used in our search tools - click on any item for more details and examples. 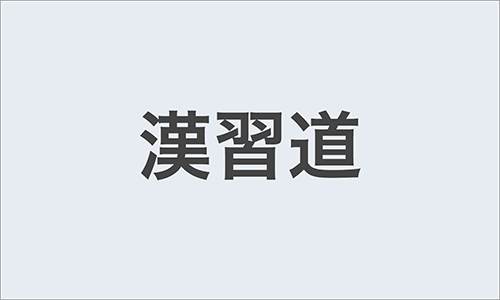 See Kanshudo system for more on Kanshudo's 'cascading kanji' format for displaying kanji. For more information, see our how to guides.